Cholesterol can be a confusing medical topic. There are measurements to understand. Medications to consider. And inherited genes and lifestyle choices to factor in. Mason Freeman, MD, an endocrinologist and chief of the Lipid Metabolism Unit at Mass General, often tells his patients that treating cholesterol is prevention medicine. Getting high cholesterol numbers under control can help prevent a heart attack or stroke, Dr. Freeman says. But it can be a hard sell to ask young, healthy individuals to take a medication for the rest of their lives. “When we start treating a 30- or 40-year-old person for high cholesterol, the likelihood for most of these individuals is, if they are going to have a heart attack or a stroke, it’s not going to happen until they’re in their 50s or 60s,” Dr. Freeman explains. Physicians can’t pinpoint when a cardiovascular event could occur or how long patients need to take medication to prevent it, so they advise most patients to begin medications early, he explains. • If you have had a stroke or heart attack, lower your LDL cholesterol to less than 70. New research supports that level provides the greatest benefit. • If you have not had a stroke or heart attack but are at higher risk for those events, lowering an elevated LDL cholesterol also has benefits. • If you experience side effects, try more than one statin. Only about 5 to 10 percent of the population cannot tolerate statins. There are different kinds of cholesterol. 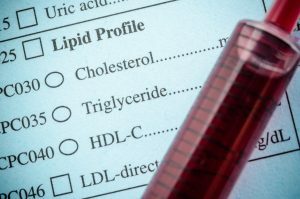 The most important form to track is low-density lipoprotein (LDL) cholesterol, which is sometimes called “bad cholesterol,” though we all need some of it, says Dr. Freeman. For many people, the liver makes about 70 percent of the cholesterol their body needs, which it uses in cells. If the liver needs more, it creates additional LDL binders that pull cholesterol from the bloodstream—lowering the amount of cholesterol in the blood. Too much cholesterol in the blood can lead to a buildup of cholesterol in arteries. That can restrict blood flow to the heart and cause a heart attack or stroke. A few factors can alter the liver’s normal process. One is diet. The other is variations in the genes we inherit. In affluent countries, many eat a diet high in saturated fats. They consume a lot of foods like cheese, butter and fatty meats. These foods send cholesterol floating into our blood. For some people, this doesn’t cause much of a problem. But for others, it does, because their liver does not remove LDL from their blood as efficiently. Researchers have linked extremely high and moderately high levels of cholesterol to genes, which can raise a person’s cholesterol by 10 to 20 percent in some cases, and, 100 percent or more in others, Dr. Freeman says. So, recommendations to lower LDL cholesterol by eating fewer hamburgers and exercising more to affect other forms of cholesterol can help—but these measures may not be enough for all patients, Dr. Freeman explains. He encourages patients experiencing side effects to see a lipid expert who may be able to identify a statin they can tolerate. At Dr. Freeman’s Mass General clinic, about 45 percent of patients cannot tolerate statins. For them, there are promising new drugs. About two years ago, a new LDL-cholesterol-lowering medication, PCSK9 antibodies, was approved for use in the United States. Dr. Freeman’s research team was involved in studies testing these antibodies in patients who could not tolerate a statin. In a large clinical trial of 27,000 patients, most of whom had already had a heart attack and took statin medications in high doses, researchers discovered the PCSK9 antibodies lowered LDL cholesterol levels on average to 30 mg/dl and reduced the risk of a cardiovascular event, stroke or death by about 15 percent over the two-year trial. Dr. Freeman’s clinic works with insurance companies and has gotten the medications approved for many patients, but he doesn’t have a solution to the cost problem for patients who don’t meet the strict criteria approved by insurers. He is hopeful that the costs will be lowered or new therapies will create less expensive alternatives. “Cardiovascular disease is still the greatest killer of all diseases in the United States,” Dr. Freeman says. “Patients at higher risk who can’t reduce their cholesterol levels with lifestyle changes should consider cholesterol-lowering medications, because they provide an effective form of prevention of heart attacks and strokes.